Writers: Jonathan Nolan, Christopher Nolan Stars: Matthew McConaughey, Anne Hathaway, Michael Caine, Mackenzie Foy, Jessica Chastain, Ellen Burstyn, John Lithgow Run Time: 169 min Rated: PG (Canada) PG-13 (MPAA) for some intense perilous action and brief strong language. 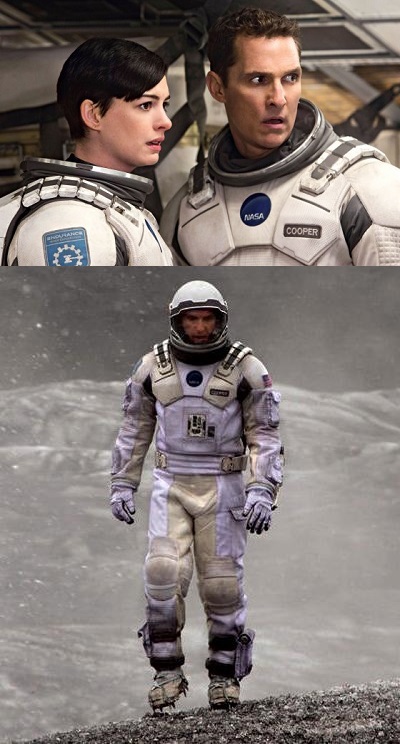 Christopher Nolan's new film Interstellar is more like his 2010 film Inceptionthan his trilogy of Batman movies. It's both cerebral and emotionally intense. This is no Star Trek,Star Wars space opera (space-soap-opera) Interstellaris a more “hard” sci-fi film in the vein of Stanley Kubrick's 2001: A Space Odyssey(1968) or Robert Wise's adaptation of Michael Crichton's The Andromeda Strain(1971). Set in a near future where blight is devastating the earth's food supply and starvation is wiping out the population, a former engineer and NASA pilot, Cooper (Matthew McConaughey), toils away on a farm with his two children and father (John Lithgow) growing corn—one of the few crops still viable for farming. The future has become something like the Dirty Thirties on the North American prairies. Dust storms, food scarcity, and economic collapse have turned the remaining population into pragmatists who eschew the idea of spending money on things like universities and federal science programs like NASA. But NASA still operates in secret and Cooper's daughter Murphy, with the help of a mysterious external force she calls a “ghost,” discovers the co-ordinates of its top-secret installation—a secret installation no one was looking for. Once inside the installation Cooper is convinced by Professor Brand (Michael Caine) to participate in NASA's project to save humanity. Cooper makes the painful decision to leave his family behind to pilot a space craft called Enduranceon an interstellar mission in the hope of finding a new world humanity can populate. Cooper's mission on Enduranceis Plan B; Plan A depends on cracking Professor Brand's mathematical equation that will allow scientists to manipulate gravity and move earth’s population off the planet in a mass exodus. Professor Brand's daughter (Anne Hathaway) is one of the astronauts on the space mission. However, the team is not venturing into space blindly; years earlier NASA had sent the Lazarus missions through a fortuitous worm hole which had appeared near the planet Saturn. Based on data received from those missions they believe they've narrowed down suitable worlds to further investigate. Upon hearing the name used for the previous missions, Cooper asks, "Why Lazarus?" Professor Brand replies, "Lazarus came back from the dead," to which Cooper quips, "Yes, but he had to die first." The allusion to Christ's bringing Lazarus back from the dead (John 11) is one of the film’s few Scriptural references. While Christians have hope in Christ for their resurrection from the dead, the film’s hope for humanity is not Divine intervention but rather for humanity (on the brink of extinction) to save itself through science. Still, Christian viewers might be interested in the way director Nolan tackles two big realities faced by humanity: evil and love. Through the lens of a purely materialistic scientific world view they are presented as a puzzle, sometimes making sense, other times running against the grain of rational understanding. In looking at evil, Professor Brand's daughter (Hathaway) acknowledges that nature can be frightening and dangerous, but she doesn't believe nature contains evil. Neither does she expect to find evil in outer space. Rather, the only evil she expects to find is the evil humanity takes with it. On the one hand, Christian viewers will find Brand's idea odd because Christians would look at the blight causing crop failure and starvation as the result of creation’s fall into sin. On the other hand Christians will recognize Brant's idea about humanity taking evil with it wherever it goes because it sounds a lot like original sin. For Christian viewers both sin and blight have the same source as detailed in the third chapter of Genesis in the Bible. One of the movie’s biggest sources of dramatic tension is found in the keeping or breaking of the eighth commandment. The evil of lies and falsehoods, told either in space or back on earth, becomes pivotal to the survival of individual characters—indeed to all humanity. Conversely, Cooper works consistently out of love to make good on the promises he has made to his daughter Murphy before boarding Endurance and venturing into space. He wants to make sure his promises don't become lies due to his failure to fulfil them. As a character Cooper tries to uphold the eighth commandment while other characters bear false witness for more or less noble reasons. When looking at love, Professor Brand's daughter at one point says, "Love is the one thing that transcends time and space." It's certainly driving Cooper and Brant. For them love is the very thing compelling them into action. At the same time there are characters who are driven by selfishness. Nolan presents both selfishness and love as kinds of survival mechanisms. Of the two, love is shown to be better than selfishness. Interstellar is one of those films that works best if viewers know very little about it beforehand. It unfolds as a mystery. The “ghost” Murphy experiences in her bedroom—a mysterious external force that helps her discover the co-ordinates of NASA's top secret installation, which become important yet again later in the film—what is it, or who is it, or who are they? What will the crew of Endurance find when they reach their destination? Which plan will work—A or B? For those who love “hard” sci-fi there's a lot here to love. The film’s science generally focuses on physics, gravity and time in relation to Einstein's theory of relativity. For the most part Nolan is fairly gentle when presenting these ideas and provides some exposition to assist viewers. Nolan is obviously concerned with accurately presenting the theories and concepts of modern astrophysics. With the help of Kip Thorne, a theoretical physicist, he handles a black hole and the nature of the black hole's gravitational forces in a way never before depicted in film. Interstellarstrikes a good balance between the chore of actually living in space with the stark but beautiful landscapes of imagined alien worlds. Plus, in the characters of TARS, CASE and KIPP Interstellar has some of the most engaging and compelling robots in recent film history. Within the sci-fi genre Nolan’s film has moments that feel a lot like Alfonso Cuarón's Gravity(2013) and is about as far away from Michael Bay's Transformers 4: Age of Extinction(2014) as a film maker can get. 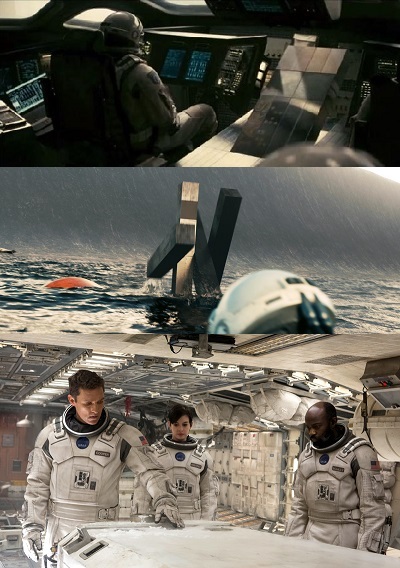 Interstellar requires concentration and attention to detail from beginning to end; without it the last act of the film may be hard to follow. If this sounds about as fun as a root canal then this film is not recommended. However, if a heady sci-fi drama with a slow-burn pay-off is desirable then Interstellar delivers. While Interstellar is keenly driven by scientific themes it's not without its poetry. Alongside its investigation into the nature of evil and love the film at a number of points makes reference to the familiar Dylan Thomas poem "Do Not Go Gentle Into That Good Night" as a way of delving into the determination and character of humanity in the face of peril. A question any viewer might ask in watching Interstellar is "How does someone respond when faced with death or the death of family and friends? Do they ‘Rage, rage against the dying of the light’, and if they do, why do they do it: For evil reasons or in love?" The Rev. Ted Giese is associate pastor of Mount Olive Lutheran Church, Regina, Saskatchewan, Canada; a contributor to Reformation Rush Hour on KFUO AM Radio, The Canadian Lutheran and Reporter; and movie reviewer for the “Issues, Etc.” radio program. Follow Pastor Giese on Twitter @RevTedGiese. Check out our new Movie Review Index! Deuteronomy 5:20, "you shall not bear false witness against your neighbour." There is also, in Interstellar, a question concerning how information can be transmitted through time. The conventional way information is transmitted through time is from the past to the present into the future, this is seen in the publication of books and in written materials as well as in art and material culture or even in new kinds of media like audio, visual or digital recording. The movie asks, 'what if information could pass through time in the opposite direction. What if it could move from the future to the present?' The Christian isn't too put off by this because Divine revelation comes to humanity from the future (and/or from outside of time entirely). Prophetic material concerning the coming of Christ recorded in Scripture is just this sort of thing; additionally information concerning the end of time and a final judgment and what lays beyond that would fall into the category of information traveling to humanity from a wholly external source, from either outside of time or at the very least from the future. Having this in mind prior to watching the film (or following watching the film) may provide some interesting avenues of contemplation. This is but one of a couple other truly fascinating thoughts presented in Interstellar that share some level of simpatico with Christian theology.